Rosatom plans to anneal a VVER-1000 reactor pressure vessel for the first time ever to extend its service life by 30 years. The operation is scheduled for the beginning of November. Until 2018, annealing had been performed on VVER-440 reactors only. The vessel is the nuclear island’s integral component that determines the duration of its service life. Neutron radiation is one of the factors that may shorten it by embrittling the vessel’s welded seams. Irradiation embrittlement depends heavily on nickel content in the vessel steel. The annealing process is recognized as an effective way of ensuring safe and reliable reactor operation. It helps recover physical and mechanical properties of irradiated steel. This unparalleled technology was developed at the Kurchatov Institute in the late 1980s. 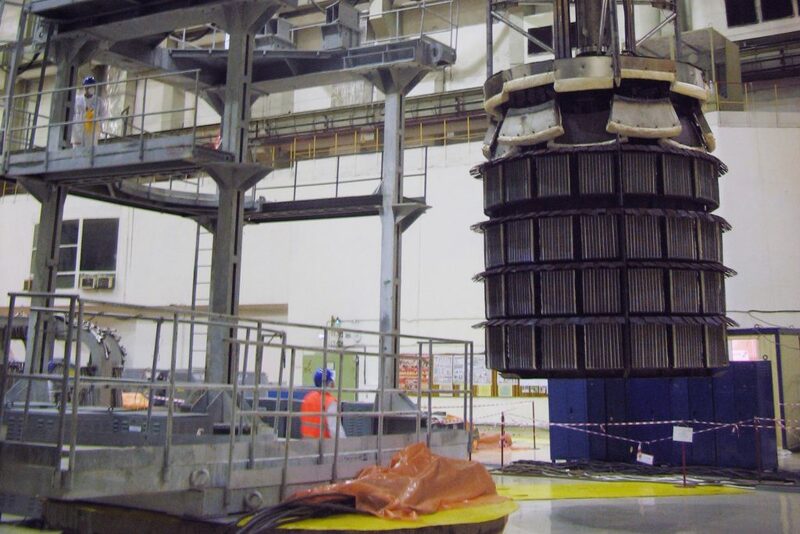 As for VVER-440 the annealing furnace is first disassembled, then transported into the reactor building and assembled inside the reactor vessel. Its steel walls are slowly heated to 475ºС, soaked for 150 hours and then gradually cooled. The procedure takes 15 days on average. After that, NPP engineers carry out a feasibility study for the life extension of the reactor vessel. “Unlike VVER-440, VVER-1000 reactors have never been annealed before. Since its walls are thicker, the annealing temperature must be approximately 150ºС higher. Why Balakovo NPP Unit 1? Because its reactor vessel is made of steel with higher nickel content,” said Vladimir Asmolov, Advisor to Director General of Rosatom. The “regeneration” effect will extend the vessel’s service life by at least 30 years. The feasibility study for the annealing procedure was carried out on a mock-up at Atommash in Volgodonsk (Russia). The design of the annealing furnace for Balakovo NPP was commissioned by Rosenergoatom. “It is just another business product developed by Rosatom. We are now able to offer annealing services to domestic nuclear plants, as well as to Czech and Bulgarian nuclear operators. We can also offer this technology to nuclear power plants with western PWR-type reactors,” Vladimir Asmolov said. At present, there are 13 units with VVER-1000 reactors operating in Russia, with 22 more in operation in Bulgaria, Ukraine?the Czech Republic, China and Iran. In the future, though, reactor vessels will need no annealing as new generation stainless steel alloys have very low nickel content.